....other than the fact that we are super fun. 1. Sometimes decisions can be overwhelming. Often times a client will come to us and have absolutely no idea how to describe their style or even what their style is. And that's just the first decision. Having a trusted resource who can lead you through the project and assure you that the right decisions are being made can relieve a lot of stress that often comes with large design projects. You won't be overwhelmed with the thousands of options for drawer pulls. Or should you do knobs? Or none. You can relax, we got this. 2. We were trained for this. We didn't spend four years stressing over tests and project deadlines for nothing. While you may have spent hours studying to be a lawyer or professor, we did just the same learning the ins and outs of the professional design world. We know how to put together a set of construction drawings and prepare renderings for you (our client) to visually understand your project. Being a professional Interior Designer means we have perks. Perks of access that is. So many of the most well designed pieces of furniture, fabrics and fixtures are "to the trade" only. Which means you have to work with a designer in order to have access to them. 4. We might even save you money, not to mention a headache. Hiring a designer can help you avoid mistakes that could be costly. Making an investment in having things done right could be the best one you make in 2017. You don't want to end up with cabinets that can't be opened when your dishwasher is open. This might not seem like a big deal but having the right contacts from someone who has already weeded through the bad ones is gold. A designer can recommend the right contractor whose pulled off successful projects in the past and is appropriate for your particular project. 6. We think outside the box. Cliche yes, but also so true. We spend most of our day thinking up creative solutions and problem solving. It's one of our favorite past times. 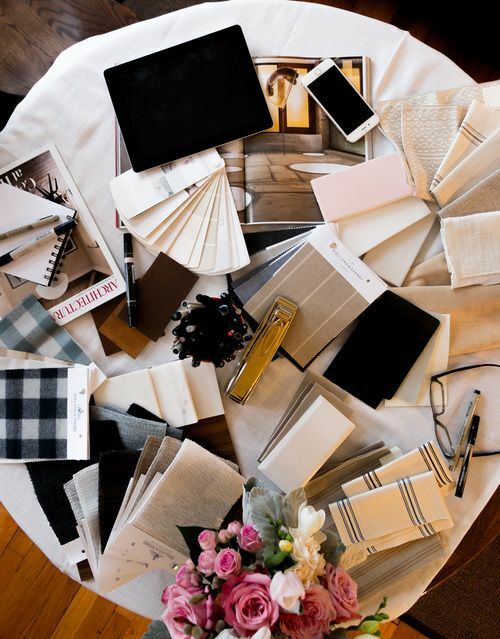 Not only are we creative planners but designers have an eye for unique color combinations, giving you the opportunity to have a home with a color palette and materials like no other. C&M Interiors thinks of the whole picture. We help our clients select the perfect flatware for their dining room table and even hangers for the closet that appropriately fit the style of their home. Even the tiniest detail can make or break a space. 8. We tell a good visual story. Designer are story tellers. We take the history of a home or family and translate it in to a space that speaks to everyone who enters the home. 9. We can talk shop. Communicating with contractors and vendors can be difficult if you've never done it before. Luckily, we have spent years chatting with these people so we serve as the perfect liason. 10. Last but not least, we are super fun. Finding someone who meshes well with you and your family can be hard. When it's right, a client - designer relationship can be one of the most joyful experiences of your life (other than your wedding day and the birth of your first child). I can't speak for all design firms, but here at C&M, enjoying the experience is our first goal for our clients. Yes, we want to be professional (and we are) but hey it's good to smile and we love to make our clients smile.